Does Potato Work for Dark Circles Under Eyes? Lack of sleep and rest is a common problem in today’s lifestyle, due to which arises a serious beauty issue of dark circles. Everyone post for a healthy and chemical -free remedy for the problem. The best solution is using a potato remove dark circles under eyes. Potatoes contain a no. 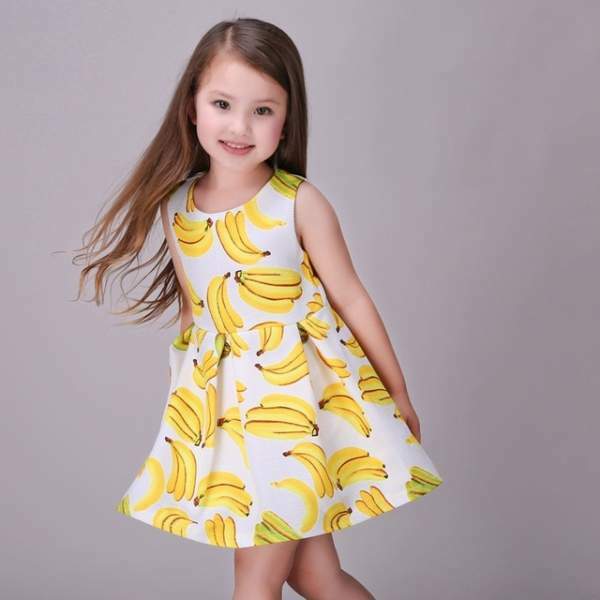 Of nutrients in it that help in the reduction of dark circles. Not only does it reduce the appearance of dark circles under eyes but it also nourishes the skin in the under-eye region. Cut a raw potato into slices. 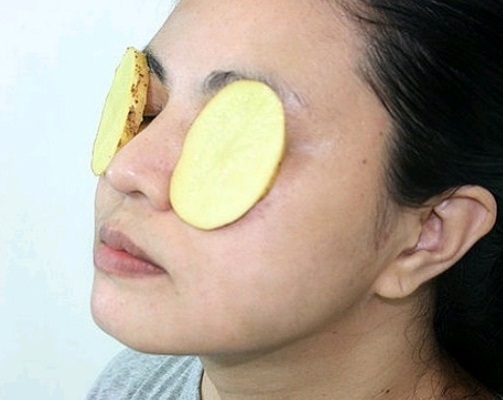 These chilled potato slices for dark circles should be applied directly under eyes on the affected areas. After at least 10 minutes, the slices can be removed. This method can be used once every day to reduce the appearance of dark circles. The catechol’s enzyme presents in potatoes and it helps to reduce puffiness under eyes. Hence, doing this remedy every morning would be best as it will make your eyes look better whole day. Sieve the grated potato with the help of a muslin cloth to extract it’s juice. 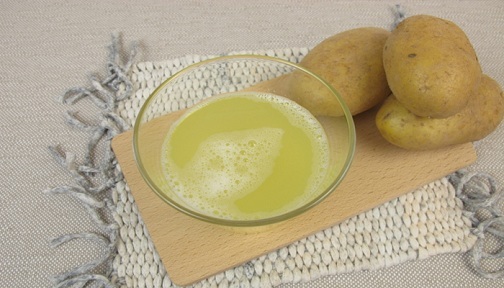 Cool this potato juice for sometime before applying. Soakcotton balls in the cold potato juice. Apply this juice under eyes using the cotton or keep the cotton balls on the eyes for at least 20 minutes. After 20 minutes, wash it with fresh water and pat dry. This remedy is suggested to be done on a daily basis. 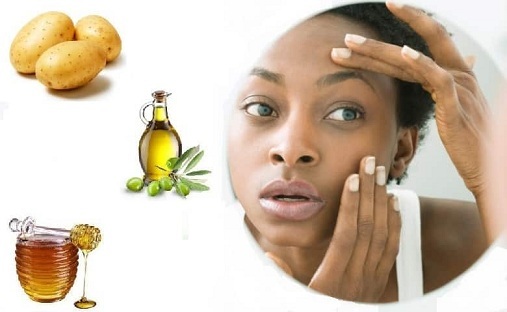 The use of potato juice for dark circles helps nourish the under eye skin using the vitamin A, vitamin C, starch, etc. This makes the under eye skin look fresh and healthy by using potatoes for dark eye circles and making the skin look more supple. Wash and peel a potato and dice it into pieces. The diced pieces of the potato are to be ground into a thick paste. To this paste add raw honey (one teaspoon per potato) and olive oil (about one tablespoon per potato). Mix it thoroughly to make a smooth paste. Apply this mask evenly on the under eye region and leave it to dry for 30 minutes. After 30 minutes wash the paste off and pat dry. This remedy should be used at least twice every week. The bleaching agents in the potato reduce the appearance of dark circles while honey and olive in the potato mask for dark circles nourish the skin on the delicate under eye region. It makes your eyes look fresher and healthier. Wash and peel a potato and a cucumber. Grate the potato and cucumber and mix them thoroughly. Sieve this grated mixture through a muslin cloth or cheesecloth to extract it’s juice. Cool this juice of potato and cucumber for sometime before use. Soak some cotton pads or cotton balls in the cold juice mixture for a few minutes. Place these cotton pads on your eyes for about 20 minutes. After 20 minutes, remove the cotton pads and wash your eyes with cold water and pat dry. This remedy must be used every night before going to sleep to reduce dark circles. It is a soothing way to use potato for dark circles under eyes. The potato juice helps reduce the appearance to circles while the cool cucumber juice helps soothe the sensitive skin under eyes making it healthy and supple. Research says that potatoes are more useful and effective than cucumber, if you want to brighten your skin around your eyes or dark circles area then 10 minutes is sufficient to take an effect from potato slices. Try this idea to get your soft and normal skin back for your beauty. 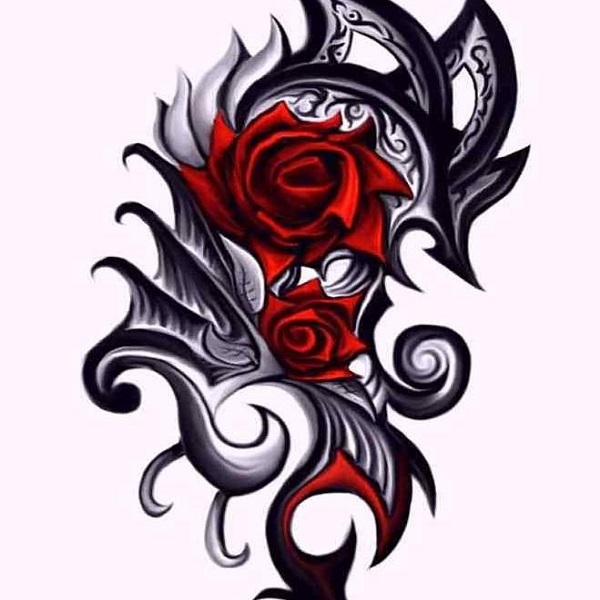 ← Previous Story How To Use Rosewater for Dark Circles Under Eyes? Next Story → How To Use Multani Mitti for Dark Circles Under Eyes?